What dog food should I feed? There are a lot of choices out there for consumers to buy as far as convenient foods to feed our pups. Lately, there have been concerns over by-product ingredients and even contaminated foods that can cause more harm than good. 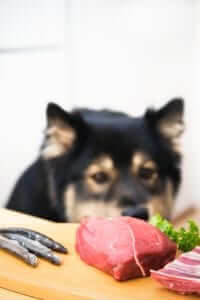 We are getting barraged with new ‘fad’ diets and “healthy” dog foods that aren’t so economical for the average consumer. With so much conflicting and confusing advice, what are the best choices for dog food? What we feed our dogs should be as nutritious as what we feed our families. We shouldn’t have to be concerned over having fillers in our dog’s food that only bring empty calories and possible future health problems. If you’re a dog owner (or cat or any other companion), it is your responsibility to understand what his basic nutritional needs are to be healthy. Just as it is for yourself and your growing children. When you know what your dog needs, you can provide it knowing you aren’t relying on someone else to have everything done properly and then find out you were fooled. Processed dog food is rampant in our marketplaces, but thankfully, the public is becoming more aware and resistant to it. Unfortunately, we can’t just trust the name brand companies to include what they may claim in their products. A lot of dog owners are making the decision to cook for their canine companions, or they are following a raw dog food diet, and bypassing the bagged food completely. Many people are doing it and they are seeing the results of much healthier companions. Our dogs’ nutritional needs are not really different from our own. Dogs need protein, vitamins/minerals and fat for health. It’s pretty simple, but we can make it complicated. Some owners focus on the protein aspect and neglect the vitamins. Other owners tend to do the opposite, but not as often. While we were in practice, I recall many owners serving their dogs extra meats because they loved it, but rarely did they offer extra vegetables. I knew of one client who loved to give her pup green beans as a treat. One out of three thousand that I knew of. Most everyone relied on prepackaged dog food. The National Research Council published an extremely informative pamphlet in 2006 outlining the basic nutritional requirements of dogs. This is important information that every veterinarian should have at their disposal for their clients. It’s basic and helps dog owners determine exactly what are the best dog food options. This article is here to back up that important information. How many calories does a dog need per day? Well, it depends on the size and activity level of your dog. Puppies always require more calories because they are growing, and their bodies are utilizing all the energy it has to facilitate proper growth. Lazy dogs won’t need nearly as many calories as active or competition dogs. Large breeds need more calories than small breeds. That’s common sense, but still how many calories are we talking about? The range of calories goes from about 300 calories (for a lazy 10lb dog) up to over 3,000 (for a 90lb pregnant dog). That’s quite a difference, but it makes perfect sense. Be careful, though, because you may have a chihuahua who is 30lbs which, on paper, will tell you that he/she needs more calories, but is that true? Most chihuahuas I have seen are rarely over 6 or 8 inches tall, so 25lbs is obese and extremely unhealthy. Those are the ones with heart murmurs or advanced arthritis due to their tiny hearts and limbs having to carry such a heavy load. The amount of dog food you choose to feed should compliment her needs, not just her tastebuds. How can you tell if your dog is at the perfect weight? If your dog is at that stage of body condition where you’re just not sure if she is fat or just perfect, there’s a quick test you can do just by touching her. Just place your hand on her side, over her ribcage, and press in slightly with your index finger. Is it cushioned so that you have to really press in order to feel the rib? She might have a few pounds to lose. You want a little bit of cushion, but it’s easy to accumulate too much in a short amount of time with too many calories and too little exercise. You should be able to feel the rib without too much pressure, but not see it protruding. You already know your dog needs plenty of protein to grow and stay healthy. So, how much is enough? Again, it’s variable. Puppies need more protein, again for growth. According to The Ohio State University School of Veterinary Medicine, a dog generally needs 1 gram of protein per pound of his weight. So, a 30lb dog needs about 30 grams of protein each day. This, of course, is also going to be variable considering his life stage and activity level. A 30lb Bull Mastiff is obviously still a growing pup, so he will probably need twice as much protein per day versus our 30lb adult chihuahua. The geriatric dog will also require more in order to keep his body condition and organ systems functioning optimally, especially if he still likes to go for walks with you. Protein is found in just about everything we eat, so try not to focus just on meats as dog food. The basic healthy list of meats that we always stood by in practice were lean meats like chicken and turkey (for those dogs with tendencies for allergies), or fatty meats like ground beef and even sometimes salmon or sardines (to add a little variety and fat). About ½ cup per day of meat will provide your dog with a range of 8g to 21g of protein. We always tried to stay as basic as possible, simply because some of the more exotic meats, like duck or lamb, really weren’t worth the cost in the long run due to the fat content and tendencies for possible reactions in dogs with skin issues. If you want to add some healthy fat for your dog’s coat and/or help maintain a healthy weight, consider the protein you are already feeding. Remember, ground beef (even the lean kind) will have more fat content than lean, skinless chicken breast. If you still feel you need to add fat to your dog food, keep it simple. You want to provide a healthy omega 3 to omega 6 ration, so your choices may be limited. Some people give flaxseed oil, which is well balanced at an omega 3:6 ratio of 1:3 but dogs may have a hard time converting the omegas properly. Stay away from the basic oils like vegetable, corn or even some olive oils. They are either processed or they don’t have the balancing ratio that you need. Two oils I have discovered to really contribute to the healthiest balance are cod liver oil and sardine oil, besides flaxseed oil. Cod liver oil is the easiest one to find, but you have to make sure it is fresh because you know fish oils can become rancid very quickly. It also has a high content of Vitamin A in its active form, becoming potentially harmful, so be aware. Sardine oil may be hard to find in your area, I know it was in mine. Vitamins and minerals are essential to proper health in every species. Several common foods contain Vitamins A, C, D, E, K and all the B vitamins. Chicken, egg, beef, liver, spinach, asparagus, broccoli, sweet potatoes, brown rice, and even butternut squash all have one or several of these essential vitamins. Adding fruits like strawberries or cranberries will add to the Vitamin C levels which also boosts antioxidant levels. Believe it or not, it all contributes to a more rounded dog food while adding natural flavor without needless calories or fillers. The same goes with minerals. Calcium, phosphorus, magnesium, sodium, potassium, iron, copper, zinc, manganese, selenium and iodine are the basic minerals we all need. Again, the list of foods mentioned above contribute to the mineral provision in your dog’s daily diet and they are easy to get. In combination on a daily basis, these foods will provide plenty of nutrition for your dog, no matter his age or lifestyle. You can be assured that because it all comes from real food, your dog’s body will absorb these nutrients properly and efficiently. The only mineral I ever felt the need to supplement was calcium, especially for pregnant dogs. This was simply because I didn’t feed foods like kale or sardines on a regular basis, which are excellent sources of calcium. Why Should I Cook For my Dog? Look, I know in this day of convenience foods and lack of time, you may think it’s hard to do. I think, however, in the whole scheme of it, the benefits outweigh any inconvenience you might experience. It’s a matter of prioritizing what is more important to you. If free time is severely lacking, then you might consider a prepackaged food, but you have to be aware of the risks you may be taking. All prepackaged dog food is processed in some way. The trick is to find the least processed food and recognize everything you read on the ingredients label. It should be simple. Chicken, for instance, should be on the label rather than chicken meal or chicken by-product. The words ‘meal’ and ‘by-product’ are tip offs telling you that it’s not the pure chicken breast you might buy in the meat market. It’s processed and can have other parts of the chicken that may or may not be ideal to feed. Plus, when you see the list of technical terms for vitamins and minerals in the ingredient list, it’s because it’s may be lacking in the food ingredients. They typically have been added as synthetic nutrients because the rest of the ingredients don’t contain enough of what your dog needs nutritionally. This is why I believe cooking for your dog is ideal. This way, you know with absolute certainty what he’s eating and the nutrition he’s getting. You don’t have to worry about contaminants, and the cost actually ends up being less. The only thing you lose is worry. One 30lb bag of Blue Buffalo Chicken dog food is $46.99. If my dog is 60lbs, according to their package, she needs on average 3 cups per day to get her nutrition. One bag will last me about 20 days. I’ve looked at the ingredients, and while they appear good, I recognize a couple of flags. I see ‘chicken meal’, and I also see ‘natural flavor’. Hmmm. I think I can do better. This all adds up to about 21lbs, which, after cooking, will end up being approximately 45 cups total. I already know that my 60lb dog ate between one and two cups per day, so if I give her two cups per day, this amount of food will last her between 20 and 24 days and she’s getting whole food nutrition. I’m already saving $15.00 every 20 days just on cooking and portioning her meals. That may not sound like a lot to you, but it’s priceless when I know for sure exactly what is going into my dog’s body. I know the fat content, the calorie content and the nutritional profile. 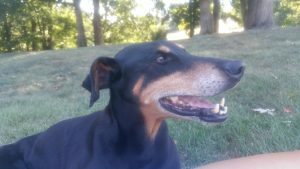 I can tell you from experience, that for my 14-year old, three-legged, 60lb Doberman, it met her needs exceptionally. Planning for my dog food is just like planning for my family meals, make the list and go shopping. I typically buy a week’s worth of food, a bag of chicken breasts usually, frozen green beans, frozen carrots, brown rice or sweet potatoes, broccoli florets and spinach or kale. I would take it home and plan the day that I would cook it, usually on the weekend. Usually, I used either my big pot on the stove or sometimes, my crockpot. The first thing I did was boil the chicken. All of it. My goal was to make enough for about two weeks, and freeze it in portions to thaw out daily for meals. Boiling the chicken is that it automatically makes a tasty broth to add moisture to the entire meal. I would season it with a little salt and pepper, sometimes oregano and paprika, and let it go. Once my chicken was done, I’d shred it into bite size pieces and set it aside. Then, I took the broth and cook my rice or potatoes in it. Boiling helps retain more nutrients and broadens the flavor. When using the crockpot, I didn’t boil the rice or potatoes, I simply put it all in with the broth and let it cook on low for 4 hours. If I used spinach or kale, I waited until the last 30 minutes or so to add so it wouldn’t be mush. With the pot on the stove, the cooking time was less, probably one hour. Afterwards, I divided it all up into 1 1/2 cup portions, as that is how much I fed her at a time. If you have a bigger dog over 60lbs, I suggest making the portions 2 cups, depending on how much they need. Generally, I would have at least a week’s worth of meals at 1 cup each to feed twice daily. Total time it took for me to complete: approximately 2 hours if I’m using the stovetop. The best thing is not only did I know what my dog was eating, but I got to flavor it anyway I like, within safe limits. It also really helped me focus on what I’m putting into my own body. I didn’t buy prepackaged dog food for her and now, I don’t buy prepackaged food myself either. I actually eat about the same things, except I can eat onions without problems. My girl has been gone for a couple of years now, so I’m a little out of practice. She loved her meals though, all the way up to her last few days. But we’ve been talking about getting another companion, hopefully a rescue English Bulldog. Whatever kind of dog ends up choosing us, he or she will have to learn to love my cooking. For Angel, who never complained about my cooking or anything else. When do you add the peas, green beans, carrots, and fruit? Hi Linda, the vegetables and some fruits can be a part of any dog’s normal daily diet. Thank you!